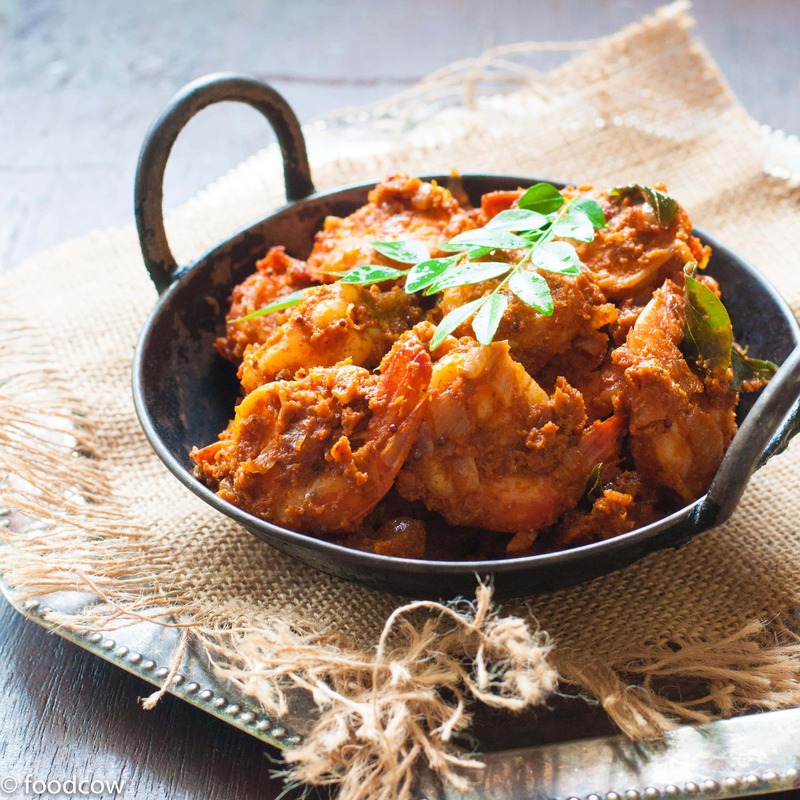 Mangalore Prawn Sukka is a dish from the west coast of South India.It is a bright orange(red in some cases) spicy and Tangy prawn roast made with fresh coconut and dry red chillies. I was introduced to Mangalorean cuisine about 7 years back when we went to Kudla, the most iconic Mangalorean Food restaurant in Bangalore, for a department lunch.My love affair with it began then. The Neer dosas, the Mangalorean Kori Gassi and the Ghee Roast, have wooed me to nose-dive deep into the cuisine with open arms.Though something or the other has always kept me from visiting Mangalore,the food remains an obsession that has grown with all the time I have been in Bangalore. This recipe of Mangalorean Prawn Sukka will give you a spicy, slightly tangy prawn roast which has the perfect balance of the warm spices,chillies and tamarind.You can fine-tune it as per your sensibilities- increase the chilli or decrease the sourness from the tamarind, tweak the salt. Salting the dish right is an art achieved only by repeatedly tasting the food and adding it in increments. For me , the easiest seafood to cook with has to be Prawn.It’s not only easy to cook but it’s also very versatile.You can literally have a fancy dinner on your table in mere 25 minutes. The ease of cooking(not cleaning! ),the amazing taste and sheer possibilities it hold’s is reason enough for me to buy it every week.I usually buy 500 gms of it and use it twice over the week. My only woe with prawn is the time consuming cleaning process.The easiest way to clean is to buy- already cleaned prawn! Trust me! If you have to clean though, use a sharp serrated knife- slice the outer side of the prawn and remove the black vein. Paneer and Potato Sukka will also be great vegetarian renditions of this iconic Mangalorean dish. Mangalorean Prawn Sukka - A spicy, tangy Prawn roast from the west coast of india made with chillies,tamarind and fresh coconut. Dry roast the coriander seeds,cumin,kashmiri red chillies, mustard and methi on low heat for 5-10 minutes till its fragrant.Set aside and Cool. Once the spices have cooled.Blend them to a powder.To that, add the tamarind and the coconut and blend to a paste.Add more water if required. Heat oil in a pan*.Once hot, add the mustard seeds, ginger,garlic,chillies and the curry leaves.Saute for 30 seconds. Add the finely chopped onions next.Cook till it's golden brown. To this, add the chopped tomatoes and cook for 5 more minutes till the tomatoes start disintegrating and loosing shape.Add more water if the pan is getting too dry. Add the cleaned prawn along with turmeric and salt.Mix gently without breaking the prawn till both sides turn pink. After the prawn turns pink on both the sides,Add the prepared coconut masala.Mix well to evenly coat all the prawn. Cook for another 10 minutes till the coconut masala becomes dry and prawns roast. Check the salt, chilli and sourness- adjust accordingly. It's best to use a flat pan for this recipe so that the prawns get roasted and cooked equally. The size of the prawn will determine the actual cooking time.Usually,if they have turned orangish pink- they are cooked. Some other BRILLIANT dishes from the southern part of India. Authentic Mangalorean Chicken Ghee Roast made with whole spices,tamrind and jaggery.